Feature piece for Global Post. “If they clear here, I think protesters should find an occupy site other than Mong Kok,” says Wong Yeung-Tat, the enigmatic, often controversial, leader of the political group Civic Passion. He knows that the clock is ticking for the pro-democracy movement’s Kowloon outpost but, exhausted as many are, few at the camp have any appetite to leave quietly. For over 50 days, protesters spread across three protest sites have been occupying roads, demanding full universal suffrage from Beijing. Mong Kok has seen the most drama, with activists clashing with masked triads and counter-protesters angry about the disruption. Now, after complaints of lost income, a minibus drivers’ association has won a court injunction permitting bailiffs to “clear obstructions” around Nathan Road with police backing. It makes for a jittery atmosphere at what is commonly regarded as the resilient frontline of the umbrella movement demonstrations. Police face a line of umbrellas during an attempted clearance last month. The discourse in Mong Kok is equally stormy. Its bellicose speakers, provocative placards and radical politics stand in contrast to the ordered, often jovial mood of the Admiralty site. The meticulous cleanliness and organization of the main site, along with its eloquent orators, won the attention of the international media. But it is over in Mong Kok that Hong Kong’s post-colonial identity crisis and social issues have come to a head. “We are Hong Kongers, not Chinese,” Wong Yeung-Tat insisted. He is in good company. A Chinese University poll found last week that just 8.9 per cent of respondents identified as “Chinese” – a record low. Since the occupations began, Wong has attracted hordes of formerly apathetic young people to his populist platform deeply critical of Beijing. Wong’s influence stems partly from the success of his social media-savvy publication Passion Times. Though some of its content is sensationalist and even inflammatory towards the movement’s original conveners, his team are continually embedded at the protest sites publishing online multimedia updates in real time. Wong’s expletive-ridden speeches and lively talk shows draw large crowds in Mong Kok, where he holds considerable sway. On the very spot where Wong laments the city’s “mainlandisation,” four branches of the same jewellery store are within view. Rents have soared in areas popular with mainland shoppers and some businesses have been criticized for converting signs, price lists and menus from traditional to simplified Chinese characters, used on the mainland. According to the Tourism Commission, Hong Kong welcomed almost 41 million tourists from China last year. 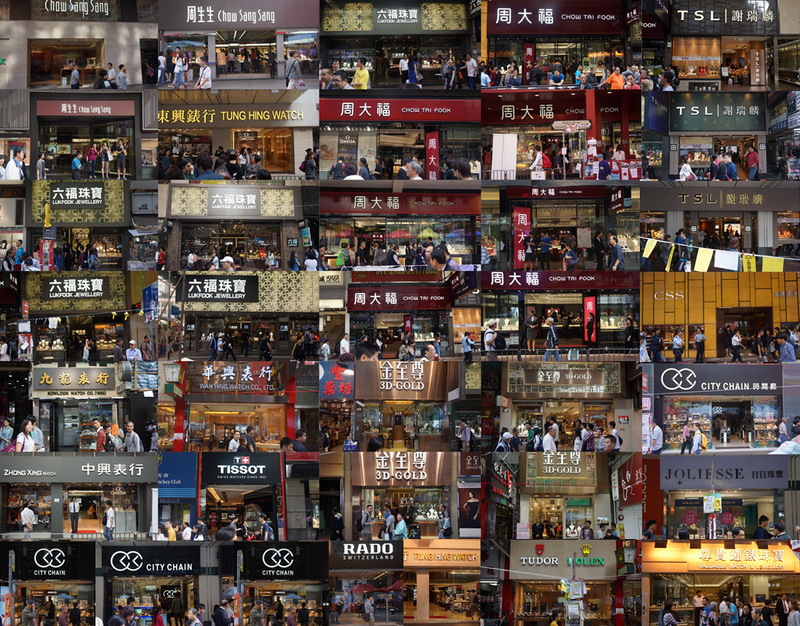 In Mong Kok’s occupied zone alone, no less than 40 watch and jewellery stores cater to the newly affluent influx of visitors. Kowloon’s ‘golden mile’ seems an unlikely battleground, but – In recent weeks – faeces, flammable liquids and even insects have been hurled at protesters, forcing them to erect nets above certain areas of the road. On October 17th, thousands descended upon the area after police attempted to shrink the site. Hours of messy street battles ensued until police retreated. A tense stalemate has prevailed ever since. Lavina Au, best known for appearing in a SocRec viral video. Some protesters here, such as Lavina Au, say their concerns are not being aired at the camp near government headquarters. “I don’t like that the people in Admiralty treat this movement as entertainment,” says Au, a 17-year-old secondary school student. Compared to the drama and tension of Mong Kok, she says that Admiralty is a relative fairground and the protesters there are “not serious”. Nevertheless, the movement’s two most prominent student leaders present a united front, keen to play down any disparities between the protests camps. “We still have the same aim,” says Joshua Wong, co-founder of the student group Scholarism. His counterpart at the Hong Kong Federation of Students, Alex Chow, was equally firm. 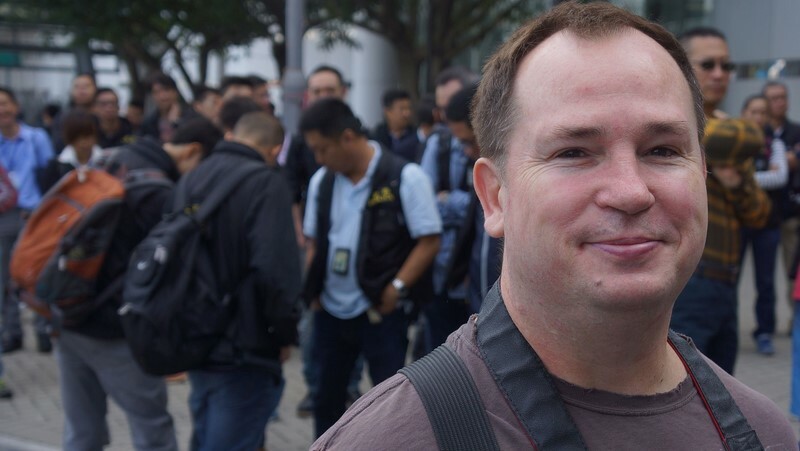 “We have been working with people in Mong Kok quite well,” he says. However, last month, leaders at the main site received a clear rebuff. On October 26th, a referendum planned by the original Occupy Central organizers was cancelled, in part due to a pushback from protesters in Mong Kok. The poll aimed to gather views on the future of the “leaderless” movement but many saw it as an assertion of authority by Occupy Central convener Benny Tai. The University of Hong Kong law professor proposed the civil disobedience campaign two years ago but, in the run up to the ill-fated referendum, his image began appearing next to Hitler and Mussolini’s on posters around Mong Kok. Deliberations over constitutional reform bore little relevance to dissenters on this side of the harbour. Each night in Mong Kok, speakers on multiple podiums rally protesters, competing with each other for hearts and minds. Occupiers, curious onlookers and foreign tourists wander between hundreds of colourful tents, several supply centres, first aids posts and improvised religious shrines. Weathered posters and countless placards are strewn across each side of Nathan Road, an essential, and usually highly polluted, transport artery for the Kowloon Peninsula. Makeshift barricades, assembled from wooden pallets, bamboo scaffolds and the remnants of broken umbrellas, mark the borders of the camp. At least seven cardboard cut-outs of Chinese President Xi Jinping guard the protester cordons. More than a humorous aside, the mere presence of the life-size Xi’s is says to “deter” pro-China antagonists – or so it is hoped. Beyond mystified images of the area as a neon-lit hot bed of crime, grime and grit, it is also the heart of working class Hong Kong and home to many of the city’s poor and elderly. It is a focal point for “working classes, unskilled labour [and] people living in the public housing estates,” says Chan, a veteran legislator with little patience for the mainstream pan-democratic parties. Like others on site, Chan does not believe the “real Hong Kongers” in Mong Kok will be following Benny Tai’s advice to await arrest when clearance day arrives. “There will be more physical confrontation and some protesters may move to different areas, different streets. I do believe less people here will be willing to be arrested,” he says. Many of those who populate the site have little to lose. Mong Kok is infamous for its coffin-like “cage home” dwellings hidden in old sub-divided apartments around the district. With little in the way of social welfare, elderly residents and the working poor pay a small fortune for caged beds in sweltering dormitories or slum-like shacks on rooftops. Last year, the government says 1.3 million people – in a city of seven million – lived under the poverty line. Of the three protest camps, Mong Kok is ground zero for matters of social inequality, as well as identity issues. Tsang is concerned about unrest in Mong Kok and says the camp needs more “sensible people.” But few know what the coming week has in store. One speaker rallying crowds is already eyeing a new campground. Daniel Ma, a 20-year-old student, expects to mobilize at least 50 people to occupy the grounds of the British consulate on Friday. He says that London has a legal obligation to defend the 1984 Sino-British Joint Declaration which gave rise to Hong Kong’s high degree of autonomy under China. The old British Hong Kong colonial flag can often be spotted around the camp and Ma says a small minority actually want the British to return. However, for most, the flag is simply a symbol of resistance – a provocative middle-finger intended to enrage Beijing. In Mong Kok, an entire spectrum of more radical views are expressed, but one academic says that radical ideas are a healthy part of any movement. Garrett says that some of the more fanatical views on display in Mong Kok may increase the bargaining power of the student leaders at the main site by making them appear more moderate in contrast. As the umbrella movement stretches into its eighth week of protest, it has inevitably become a platform for a range of grievances and has exposed underlying disputes in a decades-long democracy debate. And whilst the birth pangs of any new movement are messy and unpredictable, Hong Kong’s fight for universal suffrage is destined to continue long after the protest camps are cleared. A version of this feature appears today on Global Post.